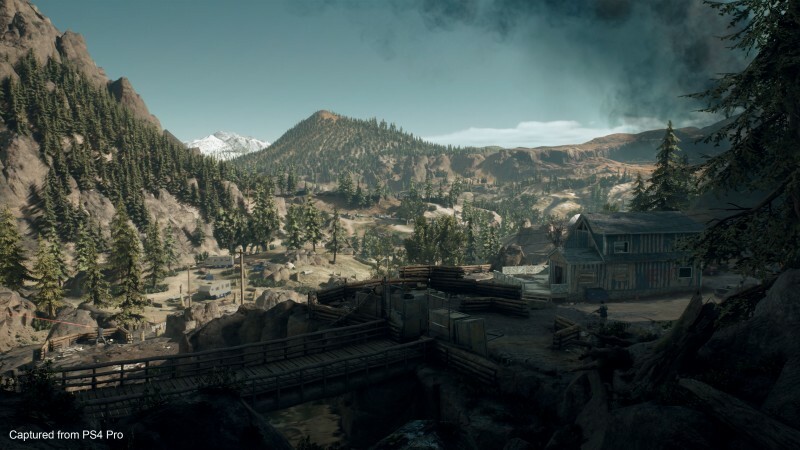 We’ve been enthusiastic enough about Days Gone to put it on our cover last June, and we jumped at the chance to get our hands on Sony Bend’s open-world game again. We were able to check out two main sections: First, we played through the game’s opening (which has changed quite a bit since we last saw it), and then we kicked around in the open world for about four hours of do-what-you-want exploration. As you might expect, there was a lot to take in. 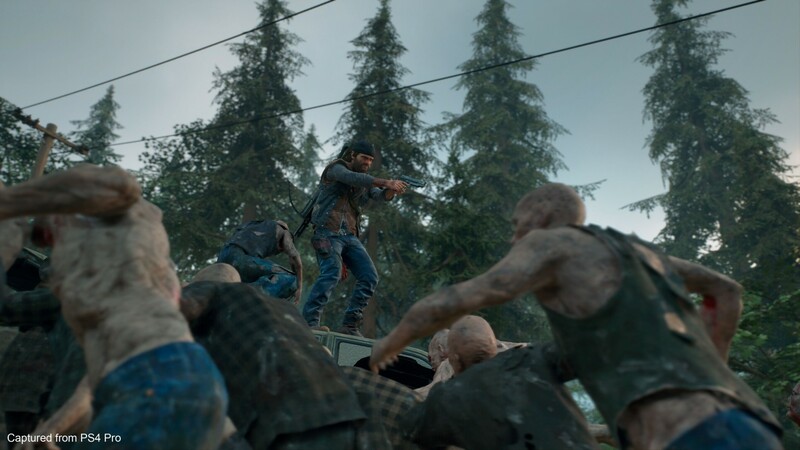 Here are some of the general highlights from our time with Days Gone. I’m not going to get too deep on specific spoilers, since the game is out next month. Like I said, the game’s opening isn’t the same as it was when we were at Sony Bend’s offices last year. A new cinematic provides some additional context for the outbreak, and also shows protagonist Deacon St. John interacting with his wife, Sarah, before she essentially disappears from his life. I break down some of the other big changes here, along with some context from the game’s developers on why those elements were modified – or in some cases, cut. It’s pretty interesting stuff, I promise! During one mission, I visited an abandoned refugee camp, which the FEMA-like organization NERO had set up in the aftermath of Days Gone’s pandemic. After clearing the camp of a few infected stragglers, Deacon visited a makeshift memorial for his wife near the ruins of some charred helicopters. What happened to her after she was evacuated from Farewell, Oregon, is one of the game’s big mysteries – or at least the early game’s mysteries. Even though I can’t say for certain if she’s alive, she lives on in Deacon’s memories. At several points in the demo, Deacon had playable flashbacks centered around their relationship. They meet when her car is broken down on the side of the road, and a run-in with some local hooligans gives her a chance to save Deacon from a beatdown by firing a gun into the air. Another sequence, hours later, delves into her job as a botanist for a bioengineering company. This flashback serves several purposes – teaching the player that lavender can be used to treat burns, and also laying out the groundwork that the pandemic may not have been an entirely natural phenomenon. She makes it clear that her contract prohibits her research from being used for military purposes, but something is probably going on there. I had my doubts about Deacon St. John that went beyond his parents’ decision to name a human baby “Deacon St. John.” Was this guy going to be anything more than a watered-down Sons of Anarchy archetype? After spending an extensive amount of time with him, I have to say that he definitely grew on me. Deacon’s not going to be hitting any open-mic comedy spots in the near future, but he’s a pretty funny and charming character. His back-and-forth dialog with his friend Boozer is natural and playful, and it establishes him as a fairly normal person forced into a completely insane world. That’s not to say he’s completely soft; he’s able to hold his own against the hardasses in Days Gone’s world, and there are plenty of them. From the moment I saw the first stealth-takedown in the opening tutorial, I knew I wanted to be as sneaky as possible. Bullets and other ammo can be scarce, and taking care of your problems without depleting your inventory seems like a smart play. Sony Bend stresses that you don’t have to interact with the stealth game if you don’t want to, but it’s clear they have some serious stealth fans on staff. 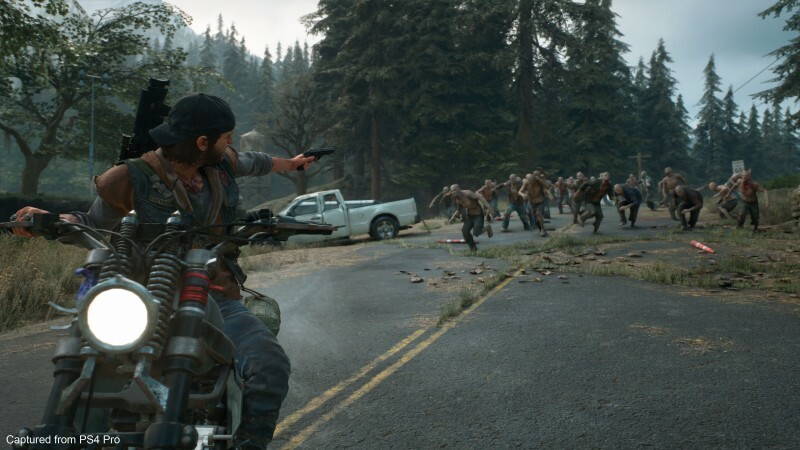 Days Gone has an incredibly satisfying stealth loop, with expertly placed enemies and long sections that seem tailored for that style of play. I was able to navigate a densely populated neighborhood undetected, methodically knifing my way through enemies by being patient and alert. At the end of that particular mission, I convinced a young survivor who had been living alone that she should follow me to safety. She seemed to understand the importance of stealth, too, as she stayed hidden and crept along behind me without any trouble – even hiding in a trash bin when I ran into an angry bear. I would have happily accepted a little help there, Lisa Jackson, but whatever. Stealth is great, but they wouldn’t keep giving you bullets if you weren’t meant to use a few of them. In one bounty mission, I decided to go in guns blazing. My target was a man named Limbo, who had secured himself in a tower along with several dozen of his closest friends. I stuck back and sniped a couple of people perched in smaller towers, but I was eventually spotted. Things got hairy, but I had the tools I needed to make it out alive. Molotovs are great at flushing shy enemies out of cover, and the shotgun was devastating against ambushers as I ascended stairways. There wasn’t anything mind-blowing about the action; it feels like a really solid third-person shooter, which is exactly what I was hoping for in that situation. Most notably, the weapons felt better, overall, than they did when I played the game last year. They were certainly functional then, but I got a sense that everything was dialed in more since that first hands-on session. 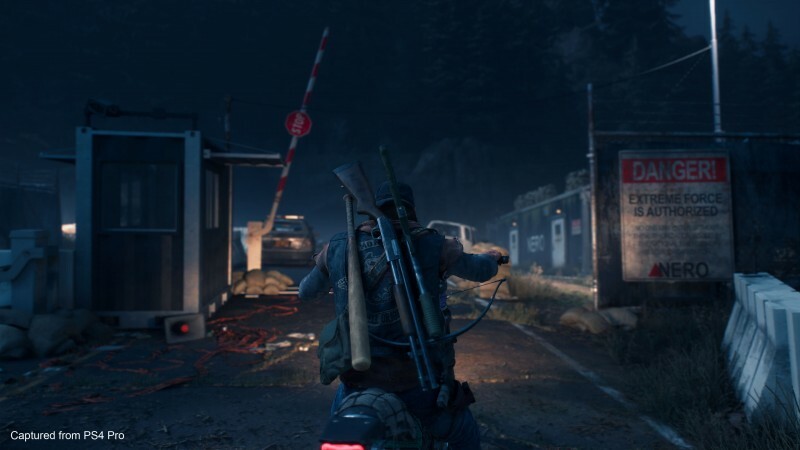 One of Sony Bend’s talking points is that in Days Gone, the world comes for you. And there’s a reason they keep saying it: They’re right. Nearly everywhere I went in the game’s version of Oregon, something wanted to kill me. A lone freaker in the road might not pose much of a threat, but there are bound to be more of them around the corner. If you don’t pay attention, you’re likely to get knocked off your bike by an unseen sniper or pounced on by an infected wolf. 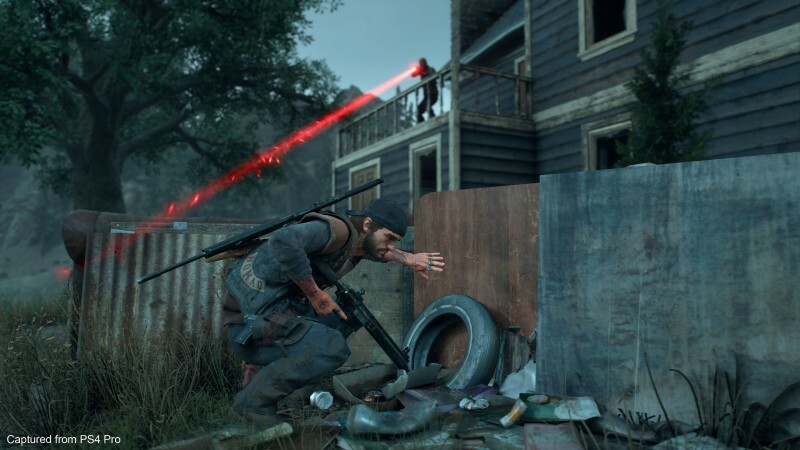 You either settle into Days Gone’s rhythm, or face a relentless string of game over screens. Is it worth getting into that gunfight, or is the sound going to attract a crowd of infected you’re not ready for? That NERO checkpoint is bound to contain some decent loot, but are you prepared to deal with what’s protecting it? In short, players who prepare and learn to adapt will come out on top. The team did soften their original stance on difficulty settings, however, and players can modify how unrelenting the experience is from the start. Deacon is considered a nomad in Days Gone, which is basically a person without allegiance to any particular group or faction. Plenty of other people have aligned themselves to various camps, however, and each of those camps has its own unique take on post-apocalyptic society. In the demo, we got to see Ida Tucker’s camp, Hot Springs, for the first time. Tucker is a former prison guard, which has influenced how she sees the world. In short, people who join her camp are treated with suspicion and worked hard. It’s a far cry from Copeland’s camp, where people have banded together based on a shared mistrust of government authority and centralized power. Performing tasks for these camps increases Deacon’s reputation, which allows him to access better tiers of items from their stores. Copeland’s camp is a great place for bike upgrades, while Tucker’s is the place to go if you’re interested in stockpiling guns and ammo. After escorting her to safety, Deacon takes Lisa to Hot Springs. Over the course of several missions, we learn Tucker’s hardass ethos may not be the right fit for a young person like Lisa. The girl’s days are spent tilling fields, and she confides in Deacon that she isn’t allowed to leave. She eventually does leave, but not in the way you might expect – the camp is invaded by the Rippers, a nihilistic gang of survivors who think trying to return the old ways is a kind of spiritual death. Lisa is taken, and Deacon has to save her. The mission ends with an introduction to Rikki, who lives at Lost Lake camp. Deacon and Boozer used to live there, but eventually left because of some… differences with management. I don’t get to see the camp, because that’s where the demo ends, but Sony Bend later told me Rikki is an important piece of the story overall. 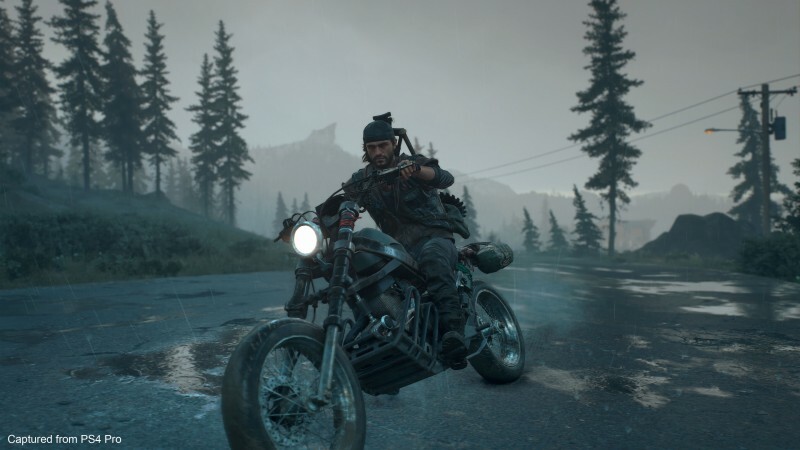 One of the things that sets Days Gone apart from other open-world games is Deacon’s motorcycle. It’s his primary way of getting around the world quickly, and it’s important. It also needs to be maintained. Run out of gas, and you’ll have to find fuel. If it’s broken, you’ll need to use scrap to make repairs. In either scenario, you’ll have to return to where it was abandoned; unlike horses, motorcycles don’t come when called. I didn’t know what to expect from this element, at least in the long run, and having several hours cleared up how the bike fits into the overall game. It never felt punitive, and it incentivized me to keep my eyes open while I was exploring. Just as in real life, I’d start keeping my eye open for fuel when my tank was about down to about one-quarter full. It’s easy to find if you know where to look (gas stations and tow trucks are reliable places), but you don’t want to make the trek on foot if you can avoid it. A trip from one settlement to another took about 40 percent of my tank, to offer some form of context on the fuel-efficiency front. I also learned that off-roading isn’t off limits, but that each botched landing or collision has consequences. If you’re methodical about looting, you’ll generally be all right. As with the gunplay, the bike’s overall handling seems significantly improved since I last played. There’s a nice sensation of weight to it, and it sounds absolutely amazing. They did cheat us to the second tier of upgrades, so I can’t say with certainty how the upgrade path flows, or whether it requires a lot of grinding. The bike is a constant part of your journey, so it’s going to be a worthwhile investment regardless. I love the Pacific Northwest, so I might be a little biased here. That said, Days Gone’s version of Oregon is a fantastic setting. There are places that are filled with lush forests, but stark rock formations and canyons are only a short ride away. The beauty is a little tainted by all the infected and crazed murderers, but what can you do? Just as importantly, it feels like a fully realized place. Moments of levity exist, but there aren’t any goofy side missions that don’t make sense for the world or characters. That’s something that Sony Bend talked about at length during our visit last year, and it’s great to see them sticking to that philosophy. When you approach a freaker horde, you get an onscreen alert that it’s close by. I learned that it’s not a message to be ignored. Even though I thought I had a pretty decent loadout, I quickly realized how wrong I was. When we took on a horde last year, it was challenging, but possible. Now I understand that these aren’t something that most players will be able to tackle in their first few hours. Try it for yourself when the game hits PlayStation 4 on April 26.